Now Then magazine October issue (download here, look for page 4 on the pdf) has an article about the share issue for the upcoming purchase of the works. Here are a couple of links to films of events we have hosted at Portland Works after dark! > structure and funding well I think, and their categories are clear (Why? How? > images, and maybe some diagrams! Our next steering group meeting will be at the later time of 6pm on Tuesday 1st June 2010. We will be in room one at the Old Junior School. Please send any agenda items to the usual email. 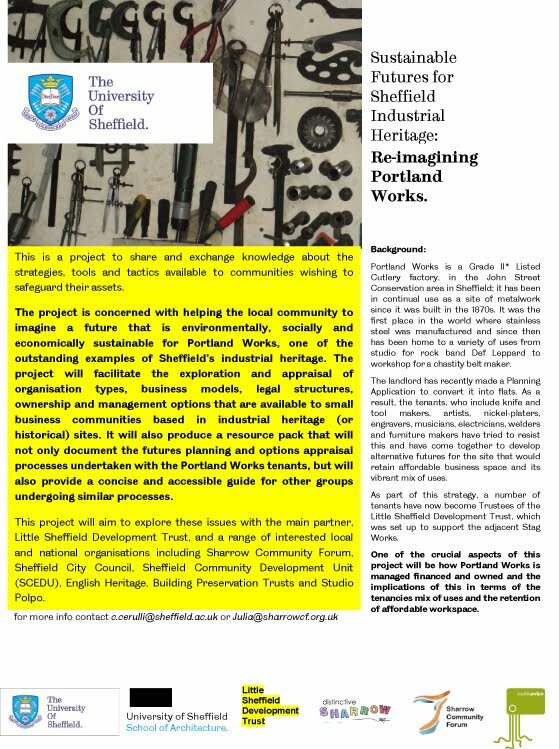 The next Portland Works Meeting will be this Tuesday 18th May 5pm at Room 1, The Old Junior School, South View Road, Sheffield. Please forward any agenda items to julia at Sharrow Forum. Listen to the audio and flick through the photo essay- they're fab! We did not take detailed minutes for this meeting but if you have an enquiry about it or any other recent meeting, please do not hesitate to be in contact julia@sharrowcf.org.uk. A curated group exhibition designed to draw attention to the traditional skills practiced at Portland Works and the people whose livelihood depends on it continuing as a working/creative community. Portland Works is under threat of closure as one of Sheffield’s remaining small industrial works, because of plans to redevelop it as apartments and offices. This lively and diverse exhibition of art and craft is designed to engage Sheffield people in an awareness of their industrial heritage and its relevance to their lives. The exhibition blurs the boundaries between art and industry, situating the objects of production, both past and present in an art gallery context, for public viewing. It juxtaposes artefacts produced by craftspeople against artists’ responses to the objects and their environment in the form of paintings, photographs, installations, sculpture and film. An installation comprising of video and sounds depicting one whole day in the working life of Portland Works. This comprises of multiple screens showing edited footage of the inhabitants of the Works; craftspeople, musicians, artists etc to portray the diversity and breadth of talent that exists there. On the corner of Hill Street and Randall Street in Sheffield, not far from the Bramall Lane ground of Sheffield United (known, for a reason, as the Blades) is a large brick building called the Portland Works. Built in the 1870s, it is one of very few workshops still used by the city's surviving Little Mesters – the highly skilled, self-employed craftsmen who formed the backbone of what was, back then, the cutlery and tool-making capital of the world. Sometime in late 1913, a metallurgist called Harry Brearley showed up at this building, hoping to interest a cutler who worked there, RF Mosley, in a shiny, chromium-heavy steel alloy he had discovered that seemed almost completely resistant to corrosion. Mosley was indeed interested, and soon enough the first stainless steel cutlery ever made left the Portland Works. Next month, Sheffield city council's planning committee will consider an application to turn Portland Works into 66 studio apartments and some office space. The structure itself is Grade II* listed, and the development looks sympathetic enough. But if it goes ahead, the small group of present-day Little Mesters who occupy the Portland's warren of workshops – a knifemaker, a tool forger, a silver plater, an engraver, a die maker – will be gone, probably for good. "I'd estimate that more people in the world today eat with stainless steel knives and forks than speak English," says Robin Wood, chair of a newly formed lobby group, the Heritage Crafts Association, which is being launched today at the Victoria & Albert museum. "You could argue it's our biggest cultural export. So it seems quite extraordinary that we can protect the bricks and mortar of a place like this, but not care in the least about the skills and craftsmanship that are so much of this city's culture and identity." Modern Britain, it seems, is not much fussed about the skills and knowledge that exist only in the minds, eyes and hands of people who make things – our living vernacular heritage. We like them, in a rose-tinted, nostalgic kind of way, but we don't do much to support them. Object online on the council website here.